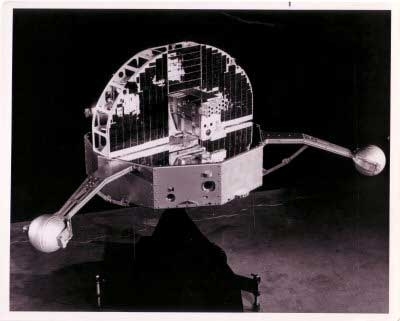 The first Orbiting Solar Observatory (NASA project S-16) was developed under NASA direction with Ball Brothers Research Corp as prime contractor with six instrument providers: Goddard Space Flight Center, Ames Research Center, and the universities of California, Berkeley, Colorado, Minnesota, and Rochester. 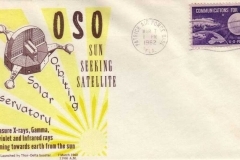 OSO-1 was launched on March 7, 1962 into a circular orbit with 33 degrees inclination and 550 km altitude. 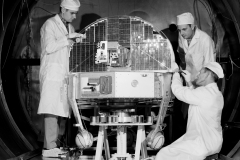 Satellite operation was nearly continuous for 1,038 orbits, after which the on-board tape recorders failed and data was only received in real time during station passes. Information was received on an intermittent basis for nearly two years. 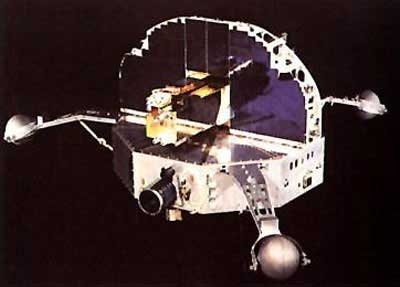 The primary objectives of the OSO-1 mission were 1) for spectrometer studies of the electromagnetic radiation from the sun in the ultraviolet and x-ray regions of the spectrum, and 2) to determine the performance of the satellite-borne solar pointing control. 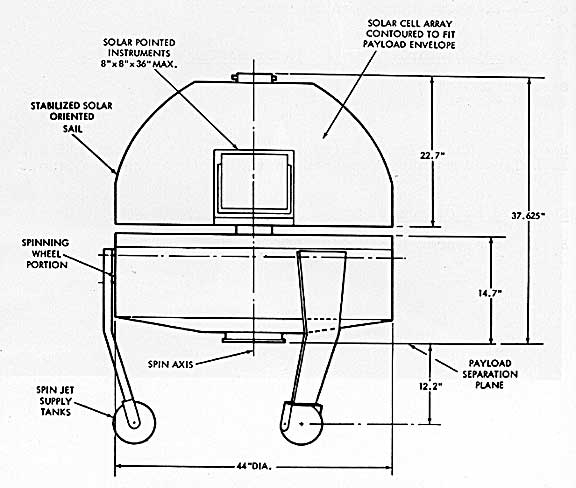 Secondary objectives were 1) solar radiation measurements using narrow band detectors to study specific regions of the solar spectrum, 2) gamma-ray experiments to study solar emission in the energy regions 0.1 to 500 MeV, 3) neutron measurements to determine the neutron flux from the earth and sun, 4) to study the time variations of solar UV, x-ray, and gamma-ray emissions from the sun, 5) investigation of surface materials for spacecraft temperature control, and 6) measurement of momenta and kinetic energies of impacting interplanetary dust particles. the Emissivity Stability of Surfaces in a Vacuum Environment from Ames Research Center. 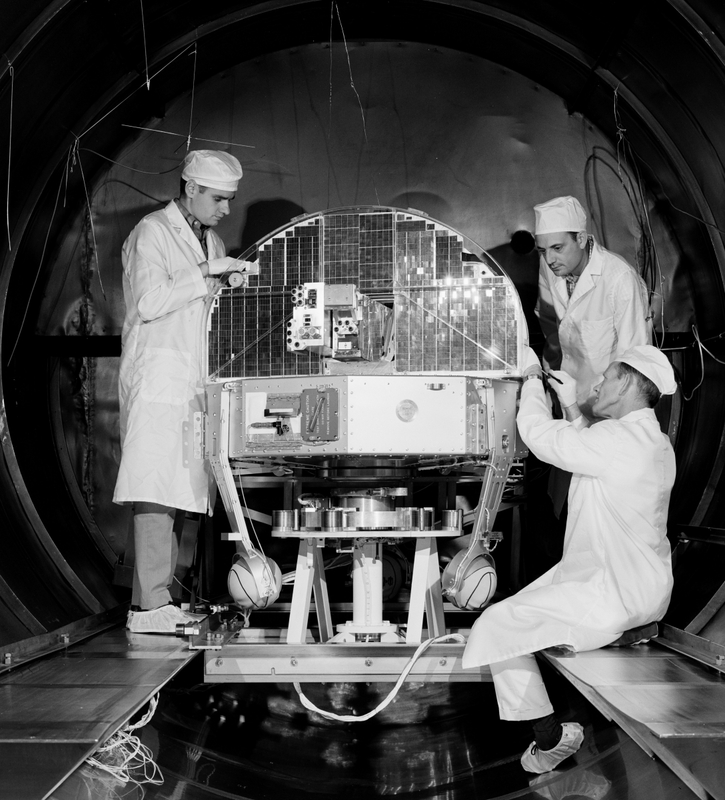 The OSO-1 spacecraft was designed primarily as a stabilized platform for solar-oriented scientific instruments. 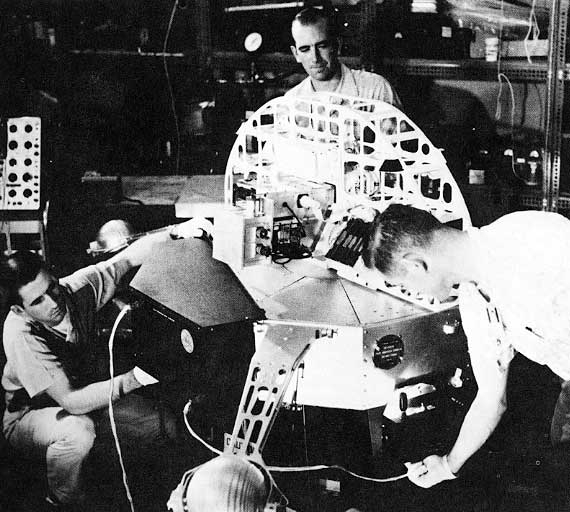 In addition, experiments not requiring fixed orientation with respect to the sun were housed in the spinning wheel section of the satellite. 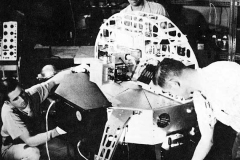 Electrical power was supplied by an array of solar cells mounted on the stabilized section. 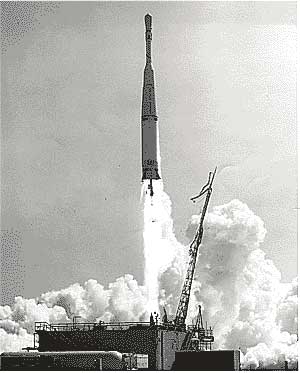 A complete telemetry and command system was provided to transmit information back to earth. 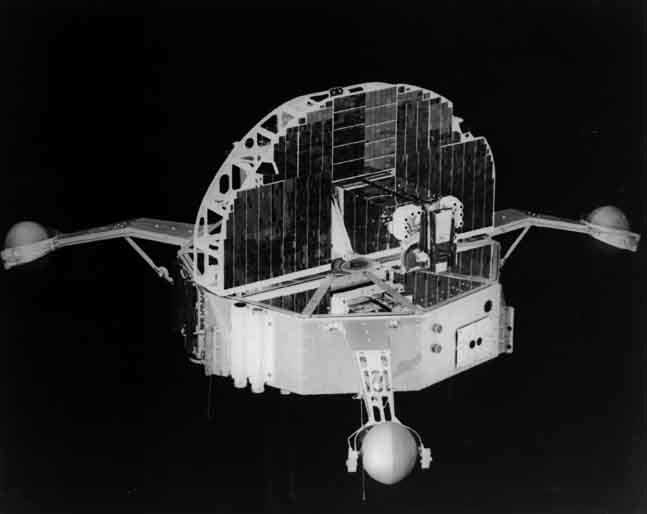 The satellite has two main sections: the fan-shaped stabilized section to which the solar array and pointed instruments are attached, and the lower spinning wheel section that housed the rest of the instruments as well as the spacecraft subsystems. Three glass-fiber spheres on extensible arms hold pressurized nitrogen gas for the spin control system. The two main structures are connected by an aluminum shaft running from the base of the solar cell assembly through the center of the wheel section and ending in the support ring structure on the underside of the wheel. Mounted on the base of the shaft is a slip-ring assembly allowing transmission of power, telemetry signals, and control signals from the stabilized section to the spinning wheel. 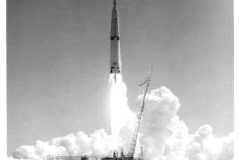 The wheel diameter was 44 inches and with the extensible arms extended the diameter was increased to 92 inches. The overall height is 37 inches and total weight was about 440 pounds. 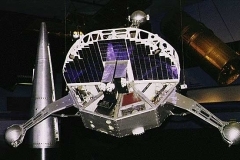 Three detector systems were provided as the University of Minnesota Gamma-Ray Telescopes, and together they monitored the intensity and direction properties of gamma-rays between 50 keV and 3 MeV. 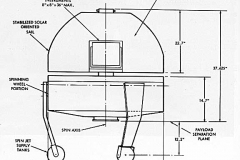 The 50-150 keV telescope consists of a NaI(Tl) crystal scintillation counter in a lead pipe shield, which looks outward through the wall of the satellite. The NaI(Tl) crystal is 2.54 cm in diameter and 1.27 cm thick. 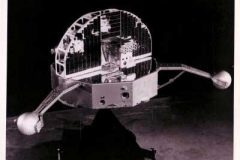 The 31 cm long lead collimator had 0.5 cm thick walls and provided a limited field of view for directional studies. A 5.1 cm diameter by 5.7 cm thick NaI crystal within an NE-102 plastic scintillator of thickness 0.3 cm formed a phoswich detector which had nearly isotropic response. 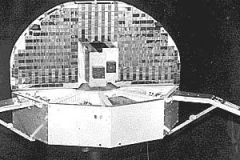 This detector was sensitive to gamma-rays in the 0.33-1 MeV and 1 -3 MeV ranges. 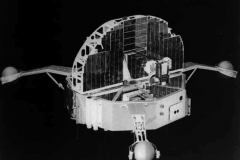 A third NaI crystal with 3.18 cm diameter and 3.18 cm height was placed in conjunction with the phoswich detector and operated in the Compton telescope mode. By proper energy selection of the event in the NaI crystal in coincidence with the phoswich, one gained insight into the incident direction of the gamma-ray. These two telescopes also provided information on the cosmic-ray rates experienced by the Gamma-Ray telescopes. 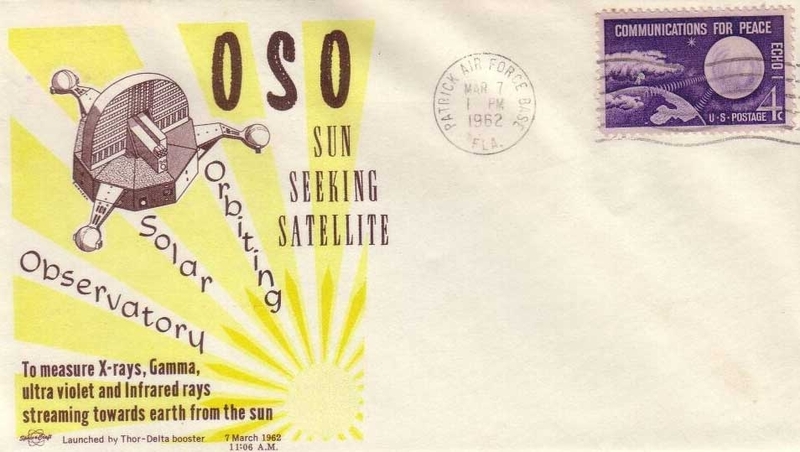 Most of the counting rates in orbit were due to cosmic-ray produced gamma-rays, as determined from the observation of a large latitude effect. A series of balloon flights with an identical instrument has allowed an extrapolation of atmospheric gamma-rays to the satellite altitude and a determination of the effects of local condensed materials. About 20% of the 1 MeV flux of 0.8 counts/cm2-s-MeV at 8 grams/cm2 over Yuma, Arizona is due to production in the 14 kg of instrument mass. At 550 km the flux at 1 MeV due to the total spacecraft matter is determined to be about 0.5 counts/cm2-s-MeV, with a differential power law index of 1.55 over the 0.3-3.0 MeV range. 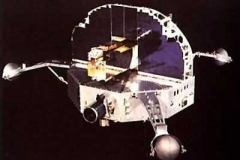 This spectrum and flux is in reasonable agreement with the production determined on the Ranger III spacecraft in cislunar space, after correction for the diffuse cosmic flux, which contributes about 0.18 counts/cm2-s-MeV at 1 MeV. About 95% of the flux measured by the 50-150 keV telescope was due to production in the Pb collimator, apparently not all due to cosmic-ray effects. Most of the Compton telescope coincidence events are determined to be a background phenomenon. About 0.03 counts/cm2-s in the 1.5-4.5 MeV range can be attributed to cosmic gamma-rays. The rest are due to earth albedo and production in the spacecraft. Peterson, L.E. & Howard, R.L. 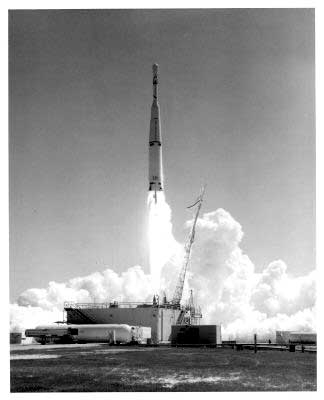 1961, “Gamma-Ray Astronomy in Space in the 50 keV to 3 MeV Region”, IRE Trans. on Nuclear Sci. NS-8, 4, 21. Peterson, L.E. & Nitardy, J.H. 1961, “Simple Circuit for a Phoswich Scintillation Counter”, Rev. Sci. Inst., 32 (12), 1390. Peterson, L.E. 1965, “Radioactivity Induced in Sodium Iodide by Trapped Protons”, J. Geophys. Research, 70, 1762. Peterson, L.E. 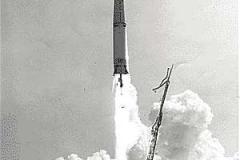 1966, “Upper Limits of the Cosmic Gamma-Ray Flux from OSO-1”, in Proceedings of Sixth International Space Science Symposium, Space Research VI, R.L. Smith-Rose ed., (MacMillan & Co.: London), 53.